After my first year in business as MelEdits, I held a two-day company retreat. I was the only participant. And I didn’t leave my home office. It was my very own solo business retreat. I now carve out at least one day every 6-12 months to reevaluate my business. Solo business owners and freelance writers are often so busy marketing ourselves, hustling for gigs and doing the work that we don’t take time out to examine what is happening every day. But my retreat helped me evaluate my business goals, marketing plan and client list and refocus my priorities. Plus, it was creatively invigorating. I hope you already have a business plan and marketing plan and look at them frequently, so I won’t discuss those here. But if you haven’t created these, you really should. And if you keep putting it off or don’t know where to begin, consider hiring a business coach to help. Carve out a new space. 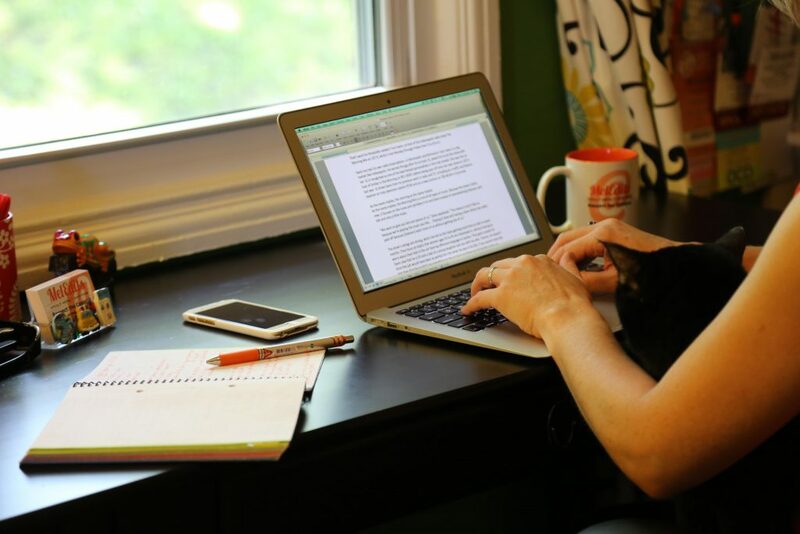 While I could have ventured to a park or a local coffee shop, I felt more comfortable in my home office with my feline officemates sleeping nearby. But I did move from my usual desk to a nearby table to give myself a new perspective. Minimize distractions. Try as best as possible to not do client work. I did need to monitor one client’s social media platforms, but I scheduled posts and tweets and checked in only during a few breaks. Turn off email and your own social media accounts. Conduct a SWOT analysis. SWOT—which stands for Strengths, Weaknesses, Opportunities and Threats—is a planning method used by businesses large and small. It provides you a strategic method for analyzing what skills you should capitalize on and what areas you need to work on. Rate your clients. You know which clients you love and which drive you crazy. But break it down, rating them on a scale of 1–10 in categories such as great to work with, pays well, pays quickly, few edits needed, topic/job feeds your soul and any other categories you deem important. (I got this idea from this great blog post.) Add up the numbers and rank your clients from best to worst. Any surprises? Is there a way to work more with the best clients? What do they need that you might be able to help them with? Is there a way to cut back, or even fire, the worst clients? Categorize your clients. Now that you’ve ranked your clients, place them into categories and add your dream list of potential clients and work. I used Sharpies and index-type cards to create lists: Keep, Expand, Fire, Go For (Prospects), Feed My Soul (Pro Bono) and Hire/Delegate. For the “Go For” list, dream big! Always wanted to be published in The New York Times, but think it’s impossible? Add it to the list, and post the list near your desk so you can see it. Start talking to other writers for tips on how to make this happen. The “Feed My Soul” list can be those clients that you take because you believe in their work, even though they may not be able to pay much or at all. Normally, I would never encourage people to work for free, but if you’re doing it because you want to help out a local organization as a volunteer, it can be fulfilling. Just make sure other work pays well enough to supplement these pro bono clients. My “Hire/Delegate” list includes other creative professionals that I might be able to hire or work with to help me expand my business or focus more in certain areas. This could be a designer that a writer teams up with to bid on a print newsletter. Or a website developer that could build websites that you write the content for. It could also mean hiring a virtual assistant, outsourcing your invoicing or recruiting an intern so you have time to expand on the areas that make more money and quit wasting time on non-paying, time-sucking administrative tasks. Make a wish list of resources. Brainstorm and research resources you should look into, sign up for or buy. This could mean joining relevant professional organizations, looking into online courses or webinars, making plans to attend a conference or buying new office equipment or software. I encourage you to go to your calendar right now and carve out one or two days for your retreat. It can be informative and rewarding and just the boost you need to ramp up your business. Please let me know how it turned out, either by emailing me or posting in the comments below. This is super helpful – thank you!! Thanks, Michelle. I’m glad you found it helpful!